Back in April, Heather Mac Donald went to Claremont McKenna College to give a talk. Some 170 students blocked the entrance to the hall, preventing people from hearing Mac Donald. Now, seven students have been disciplined in the case. Ileana Ros-Lehtinen is the congresswoman from Miami. She is also one of Jay’s favorite people in public life (and in life). A congresswoman since 1989, she is retiring at the end of this session. With Scott Immergut, the producer known as Blue Yeti, Jay traveled to Capitol Hill to record this “Q&A” in person. Ros-Lehtinen’s office was the setting. There are dogs, babies, and general good cheer: This is a family atmosphere. No one ever enjoyed being a member of Congress more than Ros-Lehtinen has. Perry Link is one of the great China scholars of today. There have been two sides to his career: He is an expert on Chinese literature and language; and he has been a boon to Chinese dissidents. With Jay, he talks about Liu Xiaobo, the Nobel laureate and political prisoner, who died last week. And about other dissidents. And about various aspects of today’s China, and its relation to the West. By the way, Jay mentions Professor Link’s famous essay “The Anaconda in the Chandelier,” which can be found here. Throwing rules to the wind, Jay does a music program: a half-hour of music about summer, or related to summer. We’ll hear Mendelssohn, Webern, Barber, and others. There’s a girl named Jeannie involved, too (with light brown hair). This “Q&A,” or non-“Q&A,” is a midsummer night’s gift. The playlist for this show may be viewed here. Jay picks his brain about an assortment of things, and Lavin’s brain is eminently pickable. A conversation about Reagan, Singapore, Japan, China, trade, the Republican party, the Greatest Generation, the American future, and more. With Jay, he talks about Putin, the diaspora, democracy, Trump, Stalin, literature, and a lot more. An experienced, learned, and bold scholar and journalist. He says that Westerners have misunderstood Russia for years – they think the rest of the world is like them. Satter, for one, avoids that mistake. With guest John J. Pitney, Jr., Ph.D.
John J. Pitney Jr. is a famous conservative professor of political science. He works at Claremont McKenna College, in California. Jay asks him about California – is there any gold left in it? He also asks Pitney about his upbringing and education. And about his conservatism. How did he get that way? Well, at 13, he started reading National Review and corresponding with William F. Buckley Jr.
As Jay says, John O’Sullivan is one of the most eminent political journalists in the English-speaking world. He is British — a Liverpudlian, and an exact contemporary of the Beatles — but he has lived all over and worked all over. In this “Q&A,” he joins Jay from his home in Budapest. Richard Brookhiser is a journalist and historian — the author of many books about the Founders. His latest book is Founders’ Son, about Abraham Lincoln and his relation to the founding generation. Brookhiser is also Jay’s fellow senior editor at National Review — and, in this podcast, they cover a lot of ground. A few weeks ago, President Trump made some remarks about the Civil War. He said, “People don’t realize, you know, the Civil War, if you think about it, why? People don’t ask that question, but why was there the Civil War? Why could that one not have been worked out?” He also said that Andrew Jackson – had he been “a little bit later” – would have prevented the war. Jay takes the occasion to have a “Q&A” with one of the most distinguished historians of the United States, and in particular of the American South: J. Mills Thornton III. They talk about the origins of the Civil War; the effect of slavery on Manifest Destiny; the issue of the Confederate flag today; and other things. Vladimir Kara-Murza is a Russian democracy leader, and one brave hombre. Twice, he has been poisoned. Twice, he recovered. And he is still at his work. Zimbabwe gained its independence in 1980. Since then, it has been ruled by one man: Robert Mugabe, the dictator. Like most Zimbabweans, Evan Mawarire has never known any other leader. Today, he is Mugabe’s worst nightmare: a principled, moral, talented, brave critic. Mawarire is a Christian pastor. Last year, he made a video, expressing love of country, and exasperation at the longstanding dictatorship. The video went viral in Zimbabwe. Mawarire was arrested, of course, and eventually had to flee the country with his family. He has since returned (and, of course, been arrested again). This week, Jay has been at the Oslo Freedom Forum, the annual human-rights gathering in the Norwegian capital. Its founder is Thor Halvorssen, who also started the Human Rights Foundation, which is based in New York. Gao Zhisheng is one of the most heroic men in China, or anywhere. He is a human-rights lawyer who has put his neck on the line and paid for it with ten years of imprisonment and torture. His wife and two children fled to America. One of those children is Grace, a senior in college, who is presently at the Oslo Freedom Forum, where Jay is too. They sat down for this “Q&A.” What’s it like to be the daughter of such a man? What does it do to you? Diana Damrau is an opera star – a German soprano – and a total delight. Jay sat down with her in New York for this “Q&A.” They talk about her new album – a compilation of Meyerbeer – and many other things: her children, her favorite singers, her technique, her dancing (including Michael Jackson routines). No one can resist this soprano onstage. She is pretty irresistible in interviews, too. See what you think. John Negroponte is one of the leading diplomats of our age. When he was a young man, he was at Henry Kissinger’s side in Vietnam. He had a Latin American career, including the ambassadorships to Mexico and Honduras. He was also ambassador to the Philippines. In the George W. Bush years, he was ambassador to Iraq, and ambassador to the U.N. He was also director of national intelligence and deputy secretary of state. 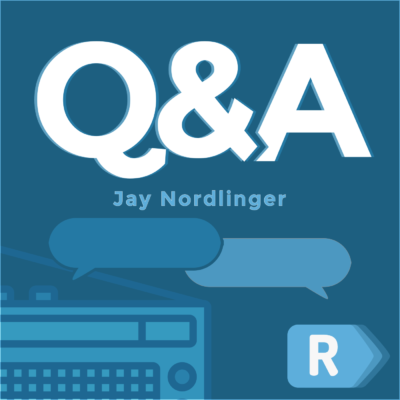 At Claremont McKenna College, in Claremont, Calif., there is a student-hosted podcast: “Free Food (For Thought).” Jay was on the campus recently. And he sat down for a podcast with two hosts, Zach Wong and Bryn Miller. It was obviously unusual for Jay to be in the “A” chair, the answerer’s chair. He is used to being in the “Q” chair. So, for something different, we thought we would share this podcast with you. The hosts ask a range of questions, some of which require a little self-reflection. Jay balks at these. But he stumbles through, in his fashion. Claremont McKenna College students conducted this podcast. They can be found on Twitter, Facebook, and SoundCloud. Jay asks her a series of questions: Why do we have it? Is it fair? What should be changed about it? And so on. A hashtag flew through the Internet: #monkmania. Jay confesses, happily, that he is a monkmaniac. Venezuela is spinning out of control: starvation, desperation, chaos, fear. Hannah Dreier, the Associated Press correspondent in Caracas, is in the midst of it. In a briefing with Jay, she gives us the latest. What does the latest include? The slums – the ruling party’s strongholds – turning against the party. The supreme court nullifying the congress. And then reversing itself. Opposition politicians seeking refuge in embassies. People getting thinner and thinner. People trying to leave, if they possibly can. Grandmothers protesting in the streets, along with the youth – something very rare.